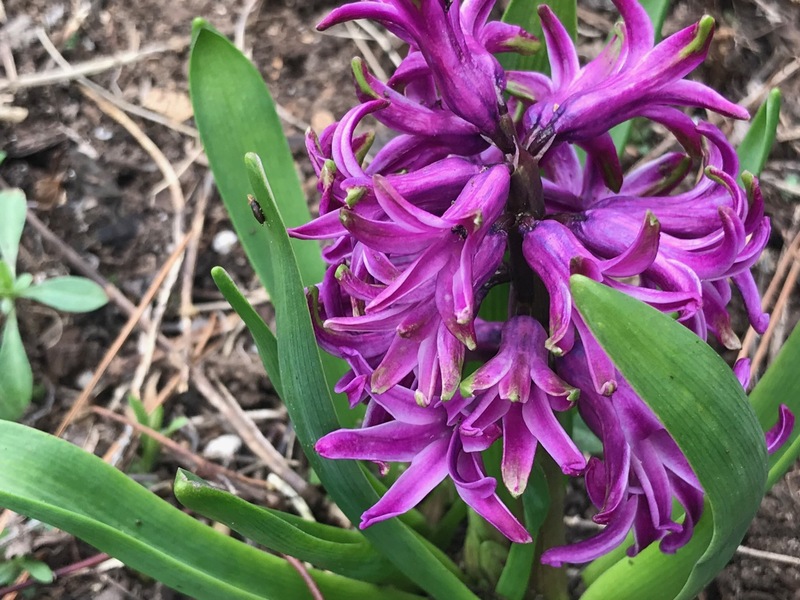 I finished the first stage of the spring garden cleanup on Wednesday, revealing this lovely hyacinth and giving other emerging plants a chance to breathe. At the end of the day piles of debris were placed in barrels and stacked on tarps out front for monthly yard waste pickup the next morning. One of the downsides of suburban living is having to pay to have to have material hauled away that, when I lived on a larger lot that was bounded by woods, I used to allow to decompose naturally. I was exhausted from the work and too tired of the chore to think of taking a photo of the waste piles, but there was an impressive mass of stuff. The locally owned waste company offers the removal service of one trash barrel of yard waste per month to customers who agree to participate annually. There is usually one month during the year when I have collected nothing for the pickup, but in late winter there is at least one month when the quantity is immense. That mostly consists of the prior year’s thick, brown woody stalks, along with whatever fresh green weeds I’ve had time to pluck (weeds are way ahead of me this year). This February’s offering also included a giant and ridiculously heavy crape myrtle limb brought down by the snow storm and branches from an old and dying redbud. Each time I have one of these excessive loads I fear it will not be picked up. This has happened only once though in 17 years, when I came home to find the piles still sitting by the front curb tagged with a handwritten note reminding me of the service limits. That time there was a substitute driver I have come to believe. But the two men who stopped by this morning were unconcerned by the amount of debris. They hopped out of the truck, smiling cheerfully. 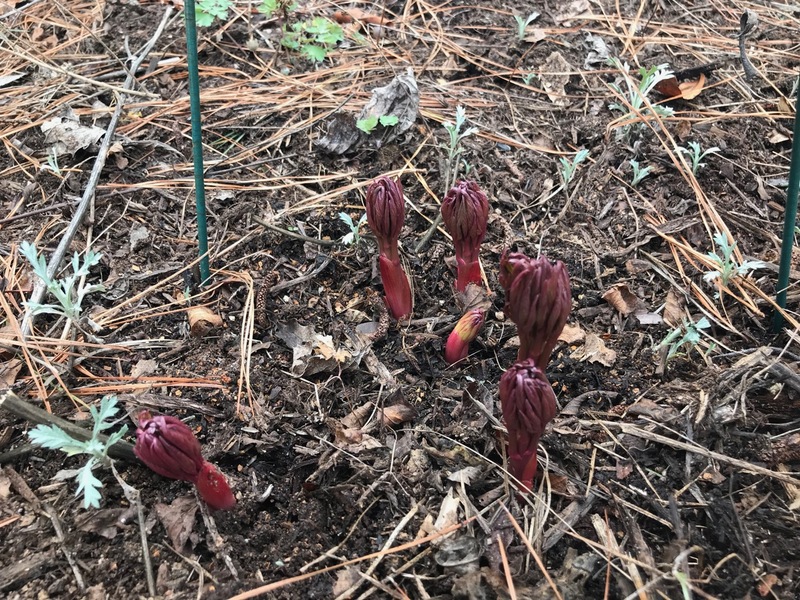 In a few minutes they had fed last year’s thick, brown woody stalks and tree limbs, the meditation circle’s fresh green weeds, a few rose bush prunings and old leaves from the now-blooming hellebores, into the deep mouth of the grinder. The machinery chewed quickly, consuming the heavy load in seconds. The friendly men soon were on their way, but not before helping me fold the tarps and rolling the barrels up to the garage. 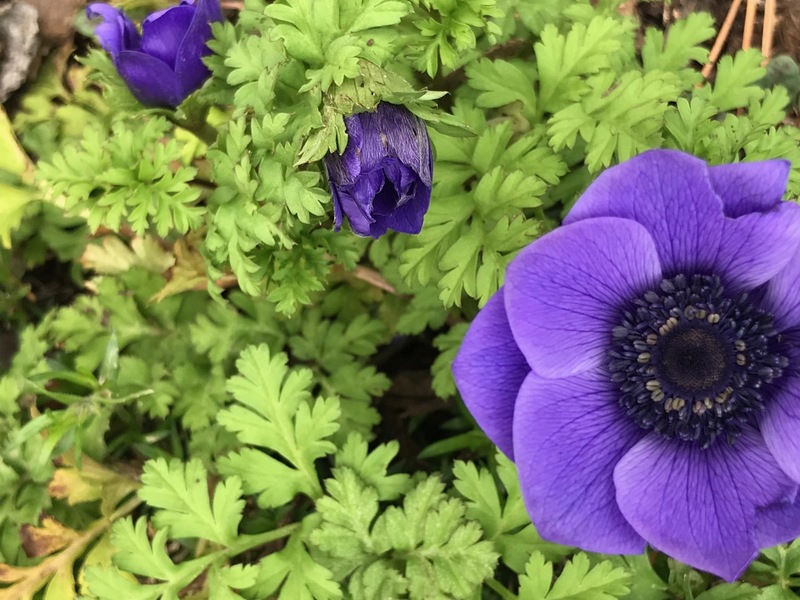 The interaction with these kind souls, along with the discovery of this anemone in bloom, made my day. 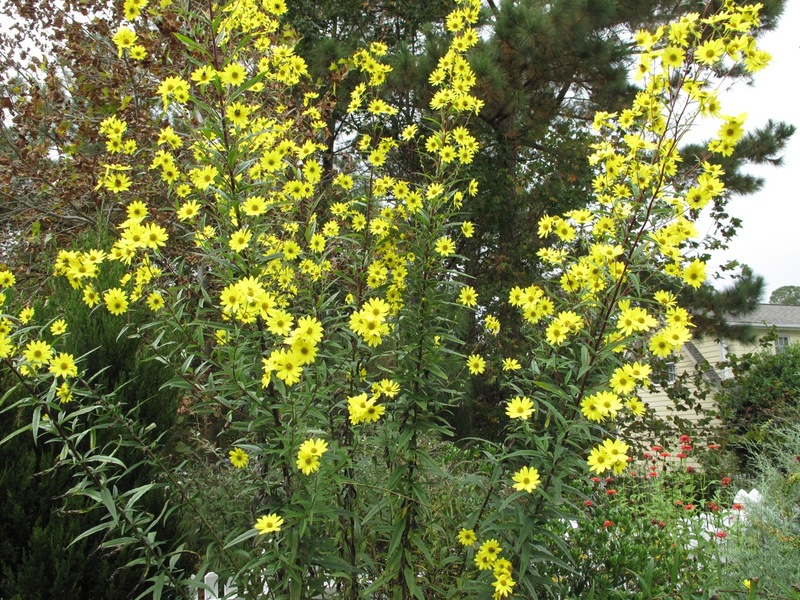 Helianthus angustifolius (Swamp Sunflower), grows 8-10 feet high and spreads to 4 feet wide. Native but can be invasive. This made big headway last summer when I was not tending the garden. The stalks are strong and heavy. 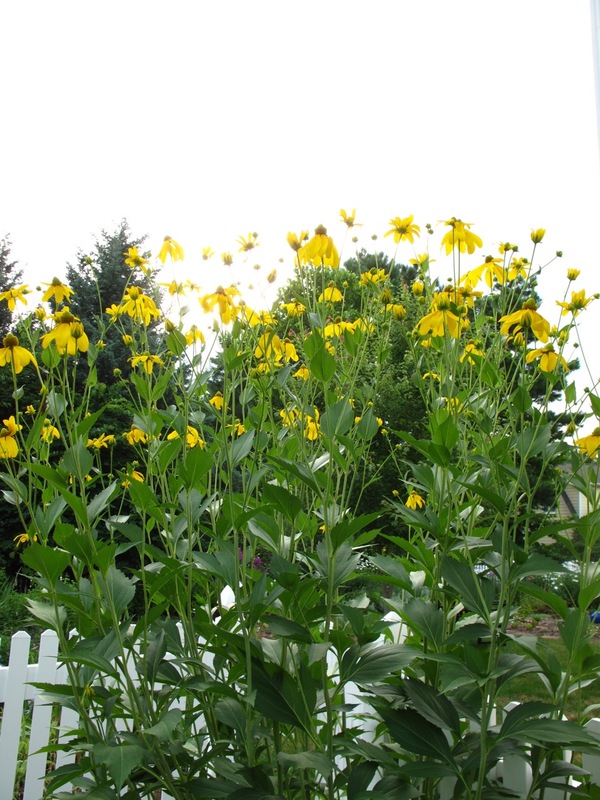 Rudbeckia laciniata (Green-Headed Coneflower), grows about 8-9 feet tall and spread 2-3 feet. 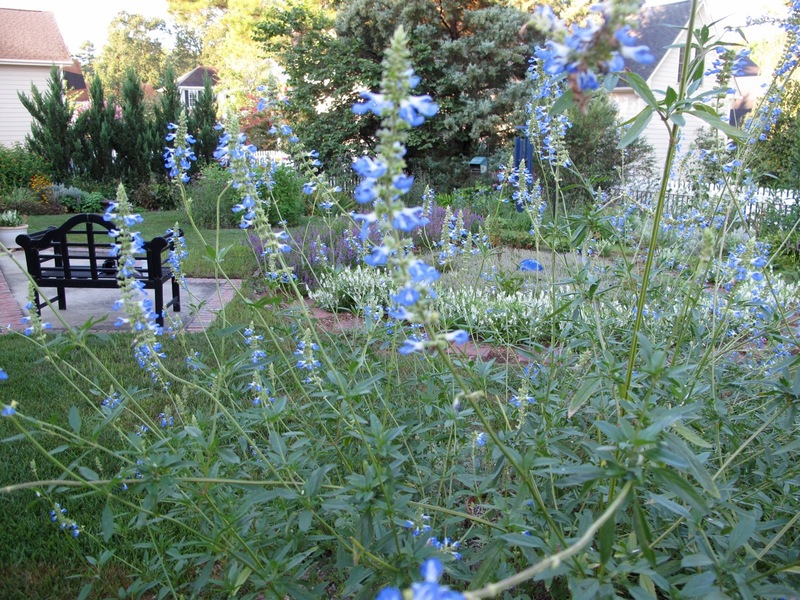 Salvia uliginosa ‘Blue Sky’ (Bog sage), grows 4-5 feet tall, but spreads about 3 feet. Leucanthemum x superbum (Shasta Daisy). A couple of plants originally, these have spead down the front of a 10-foot border. Last year’s brown stems have to be cut individually away from the plant. 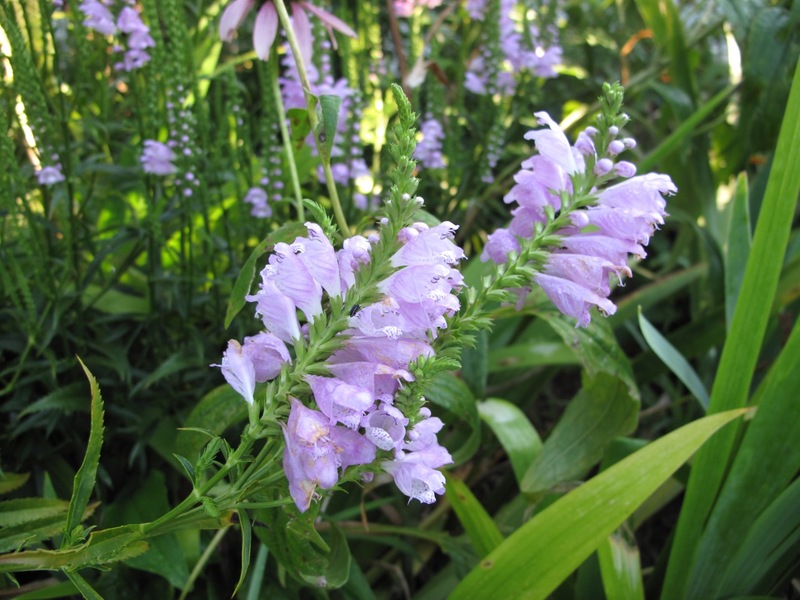 Physostegia virginiana (Obedient Plant). Spreads aggressively by rhizomes. This has created a disaster in my northern (southern-facing border). 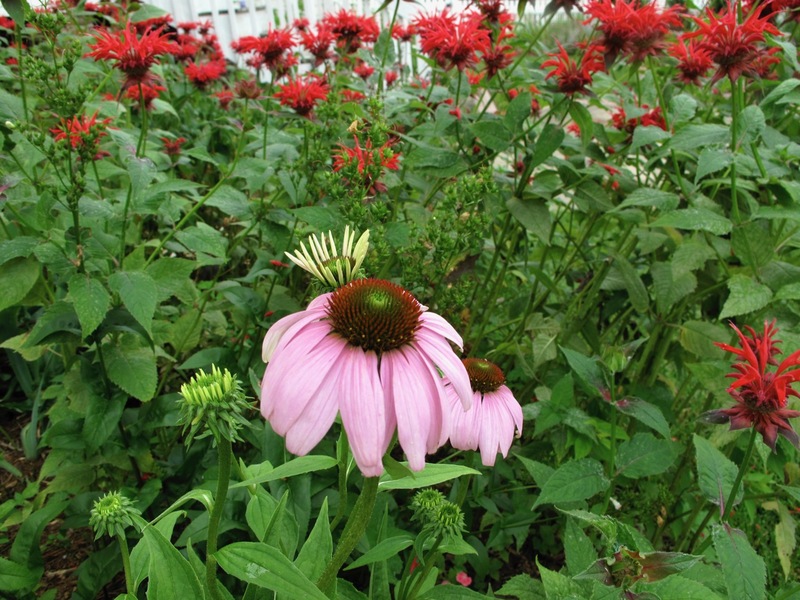 Echinacea purpurea (purple coneflower) and Monarda didyma (Scarlet Beebalm), minor sized stems that can be easily broken away from the base, but a chore nevertheless. Some of these plants I could not remove without digging up entire borders, some I would not want to give up. I love them for their flowers and for the way they attract pollinators. So they all remain a part of spring cleanup for the near future. What takes the most effort in your garden getting ready for spring? 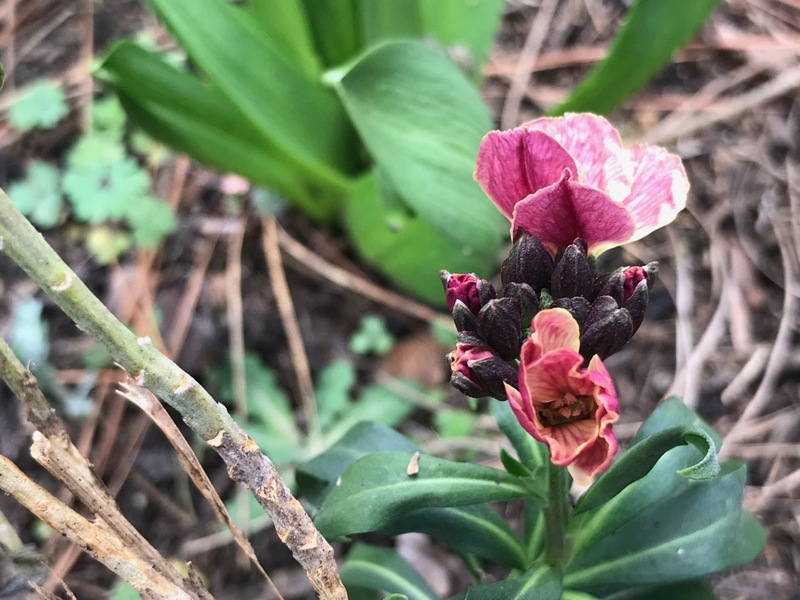 This entry was posted in garden and tagged winter gardening chore on February 22, 2018 by pbmgarden. Your garden pics are lovely and it’s exciting to see what has already poked through. Spring! I miss having woods nearby where I could resettle yard waste. The earliest little spring flowers bring such hope. All my dead stalks go into my three compost bins and eventually get put back onto the garden as a mulch. Leaves go into a huge pile in the woodland and rot down to make lovely leaf mould for the garden and any new plants that I buy. Sweeping up the leaves is my biggest chore, it starts in October and carries on till Christmas, but I wouldn’t be without my leaf mould! That leaf mulch sounds like the greatest Pauline, but it must be a lot of work. I think that’s the best material to have around a garden. Happy weekend. Lovely selection of flowering plants – so colourful. Thanks Malc. I wouldn’t necessarily choose them all again but they are nice when in bloom. Wow, raking leaves again in spring seems like a high price. I use the birds to justify waiting to to do the trimming until late winter. It’s interesting to hear how your green waste is collected. We have bins for green waste, collected every two weeks, so I can fill it with cuttings, weeds etc that I don’t want on my compost heap. It is usually almost empty in winter! Miscanthus trimming would be a difficult chore–glad you have help with it. We live outside city limits and so must contract for our own waste pickup. I also found your description of the yard waste collection process interesting, and so very different from ours. We’re allowed up to 3 large green bins and our pick-up is once a week. On a quarterly basis we’re also allowed a supplemental pick-up specifically for green waste. I rarely fill all 3 bins but I have them on call and have even loaned one here and there to neighbors for the quarterly pick-up. Our green waste pick-up is ostensibly free, as we’re charged based only on the size of our regular trash and recyclables bins. I’m guessing that the green bin material gets composted and sold – it may well comprise some of the compost I order periodically by the truck-load from a local company to mulch my garden. If only I had the space to compost it myself! After seeing the beautiful spring and summer plants in your garden, I’m sure you’re anxious for the arrival of spring. Now you’re prepared to enjoy it! I would appreciate those 3 bins and a neighbor who would share! We live outside city limits and so must contract for our own waste pickup. We don’t have truck so hauling our own yard waste is difficult (though we have tried it). The country does compost the waste and offer it back to residents but the station is 30 minutes away. 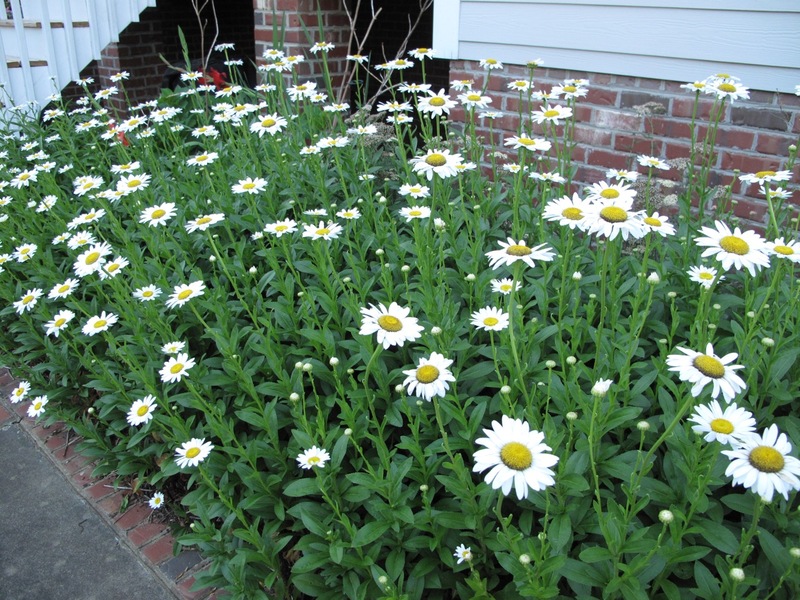 Your plants get so much larger–I’m lucky to get a shasta daisy a foot across, Echinacea is a weak annual–so interesting to see the differences climate makes. Here the yearly horrible job is re-mulching the garden. I get a truck load of mulch delivered and spend 10 days spreading it all out. Hot baths afterwards are mandatory. I usually mulch the garden also but it’s a tiresome, job I may not get around to. Good luck with yours and enjoy the hot bath reward. I have not seen physostegia in many years! The physostegia was passed along by my mother’s cousin decades ago. I brought it from my former garden but it’s behavior here is completely different. A real nightmare. My great Grandfather’s rhubarb was invasive in his garden, but I continue to grow it anyway. However, it is quite docile now. 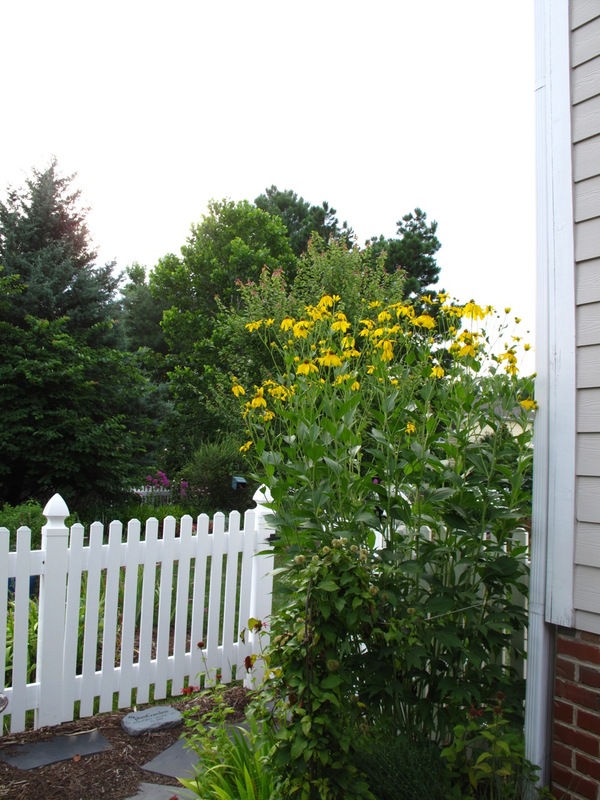 I love the look of that swamp sunflower! It’s something like my cup plant. Cup plant doesn’t spread by rhizome but it self-sows pretty aggressively. The swamp sunflower is almost a neon yellow. I like your cup plant but am wary! I’ve just started composting, no idea whether it will work but I hope so! I’m really frustrated this year because it’s been far too wet up to now to get out onto the soil and just as it is drying out we are to be hit by a cold snap. I’ve decided to leave the old foliage in situ for a little while longer to help protect the plants. Not that many shoots will be pushing up just yet, not if they’ve any sense! Good luck with your composting. It will be wonderful to have that beautiful soil to call upon later. We can have a garden waste collection service by the local council if we pay for it. They then compost it in huge clamps and sell it to the public in bags from recycling centres. Your garden waste collection sounds great. It is available here to for people who are within city limits (and therefore pay city taxes). We’re a little bit outside of town so are limited in services available. Eventually though our yard waste that is collected also is turned into compost and repurposed. Wow, that ‘Mr. Fokker’ Anemone is incredible! Your Peonies are pretty far along already. Spring has sprung in your neighborhood! Beth, it is so exciting to see these spring flowers, but with an annual frost date of April 15 I know we’re not out of the throes of winter yet.